Bob Westphal, owner of Wesmar Racing Engines, has been fascinated by the inner workings of engines since childhood. "I can't tell you how many times I took apart and rebuilt my parent's lawnmower, my mini-bike, car engines, whatever," says Westphal. Westphal's first job was in 1968, building engines with Ed Pink Racing Engines in Van Nuys, California. He was promoted to shop foreman in 1970, building top fuel and funny car engines for legendary clientele such as Don Prudhomme, Ed McCulloch, Don Shumacher, Barry Setzer and Tom McEwen. Westphal eventually moved back to his home state of Nebraska, where he built short and long blocks for Raymond Beadle, driver of the Blue Max funny cars. "While the funny car drivers were out on the road, I would be building fresh replacements for their worn out engines," says Westphal. Along the way, Beadle's drivers won a couple of NHRA World Championships. Westphal was then tapped to build sprint car engines for Beadle's World of Outlaws team with driver Sammy Swindell. 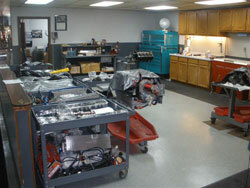 In 1986, Westphal put all his experience to use and Wesmar Racing Engines was born. Partnering up with Steve Carbone, another top fuel engine builder at Pink's, the two set up shop in Bixby, Oklahoma and began building 360 and 410 cubic inch sprint car engines. He is now joined by his son, Kelly and they have recently ventured into rebuilding 4 cylinder midget engines. "Customers come to us because they know we build fast and reliable sprint car engines and that we use nothing but the best parts money can buy," says Westphal. Wesmar Racing relies on K&N's reputation as the leader in filtration technology. "We were using a competitor's oil filter until we began having problems and decided that a switch had to be made. Someone in our shop suggested a K&N oil filter. We ordered a few to start out with and now here we are, two years later, and every engine going out the door has a K&N oil filter on it. We haven't had a problem since," says Westphal.